By Justin Wier | October 14, 2017 at 12:05a.m. 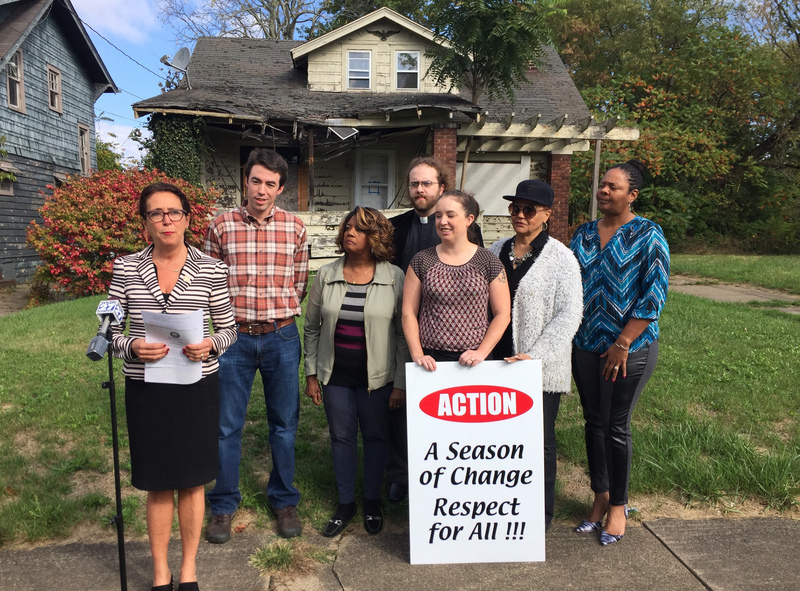 State Rep. Michele Lepore-Hagan and several community leaders gathered in front of a dilapidated house on the South Side to discuss her new legislation aimed at reining in the abuse of land contracts. Land contracts, also known as rent-to-own or lease-to-own agreements, have been used by several out-of-state companies in the city and have drawn the ire of community leaders. “A growing number of dishonest firms are using this practice to trap trusting buyers into predatory situations,” Lepore-Hagan, of Youngstown, D-58th, said Friday. Ian Beniston, executive director of Youngstown Neighborhood Development Corp., said the bill Lepore-Hagan introduced in the Ohio House of Representatives last week is modeled on legislation in other states. Standing before a boarded-up house on Lucius Avenue with the roof falling in above a collapsing porch, Beniston said out-of-state companies are attempting to profit off the wreckage of the housing crisis. “This is part of the wreckage they leave for the cities to clean up,” Beniston said of the house. In a typical scenario, an investor will purchase a home for $3,000 and turn around and offer it to a buyer for $3,000 down and $200 a month over 10 years. The party issuing the land contract still holds the deed, so if the buyer under the contract defaults on a payment, the issuer keeps the money collected and the home. In addition to providing buyers with a legal recourse, Lepore-Hagan’s legislation would require companies to make repairs to comply with local building codes before issuing land contracts. YNDC plans to travel to Columbia, S.C., later this year to deliver a bill to Vision Property Management, the company that owns the house on Lucius, for work done on their properties across the city. It is in the thousands of dollars, Beniston said. Rose Carter, executive director of ACTION, an interdenominational group dedicated to overcoming poverty and social injustice, said predatory lending is racism because it disproportionately affects minority communities. “These are investors that are outside of our community, taking advantage of the misfortune in our community,” Carter said. The Alliance for Congregational Transformation Influencing our Neighborhoods will have an information session from 3 to 4:30 p.m. Oct. 29 at Mount Zion Baptist Church, 827 Wilson Ave., on the city’s East Side. Realtors and others will be on hand to answer questions. Beniston also encouraged people involved in a land contract to call Community Legal Aid, which can provide free legal assistance, at 330-744-3196. October 13, 2017 11:44 a.m.